A DBMS SQL flow allows you to enter dialect-specific SQL SELECT statements for extracting data from a relational database. Dialect-specific SQL is the SQL specific to one particular relational database, such as ORACLE or MS SQL Server. You can type in the SELECT statement, or import it from a pre-existing .sql file. A DBMS SQL flow only contains a specialized SQL object where you select the DBMS adapter and connection, and one or more target objects. Synonyms for sources are neither required nor used. Tables must be identified using the same names as in the database. While source transformations cannot be used, target transformations, functions, variables, validates, target properties, and record logging can be used. The procedures for using these capabilities are the same for DBMS SQL flows as for more typical data flows. For information on these procedures, see the appropriate topics earlier in this chapter. The following procedure uses the Microsoft SQL Server pubs.dbo.authors sample table, and the Microsoft SQL Server difference scalar function, which is not available in ANSI SQL. Right-click the application directory where you want the new data flow, select New, and then click DBMS SQL Flow. An empty flow appears in the data flow workspace. The DBMS SQL Flow tab opens by default. A DBMS SQL Object appears in the center of the workspace. Right-click the DBMS SQL object and select Properties. Select an adapter and connection from the drop-down menus and close the Properties panel. The Select Statement dialog box opens. 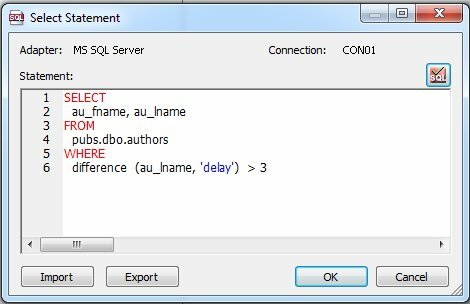 Type a dialect-specific SQL Statement, like the following in the Select Statement dialog box. Test your SQL by clicking the Test SQL Statement button. Click Close. Then click OK. Note: The SQL statement must be a SELECT statement that conforms to the dialect-specific requirements of the adapter. Optionally, you can import an SQL statement from an existing .sql file by clicking the Import button, selecting an SQL file, and clicking the Select button. The SQL file must be in one of your Application Directories. Optionally, you can export SQL statements as .sql files for later use by clicking the Export button. Select a Server and Application Directory from the drop-down menus, enter a File Name, and click OK. Drag a data target into the workspace. You can also right-click in the workspace, select Add Target, then Existing or Add Target, and then click New. Enter a name for the flow in the File Name field and click OK. You can also select a Server and Application Directory from the drop-down menus.